FOPC has to raise costs for staff, maintenance, education materials, website and overheads. We will remain open with the help of donations, regular contributions from our Guardians and by having events and functions at the castle. We appreciate the donations given by those who visit the castle too: please give generously. 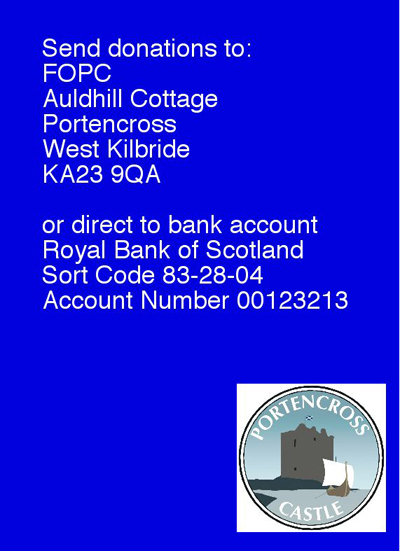 Friends of Portencross Castle is very grateful for the vital support of the public by way of donations and attendance at fundraising events. 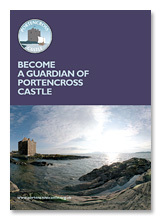 If you would be willing to give more regular support, then please consider donating or becoming a Guardian of Portencross Castle. Most of the Guardians pay small monthly amounts, as little as £2.50, by Bankers Standing Order. You could pay more if you wish. The income from small regular payments is very valuable to the long term FOPC Business Plan and helps to safeguard the future of the castle as a high quality visitor attraction and cultural resource. Or you might prefer to make a one-off payment (currently £200), to become a Guardian for Life. Some people give this as an interesting and unusual gift for a special occasion. FOPC, Auldhill Cottage, Portencross, West Kilbride, KA23 9QA. FOPC is a Scottish Charity (No. SC028181) dedicated to conserving the castle and providing access to the building. In 2007 FOPC was awarded grant support from The Heritage Lottery Fund, Historic Scotland and the Architectural Heritage Fund. With additional support from local charities, North Ayrshire Council and many individuals, FOPC was able to raise just over £1 million pounds for the costs of the project.